We have a new visualisation posted over on the Geonet blog depicting the geography of internet access. Head over there for the full post and some interesting summary stats. A few months ago, Antonello Romano and I published some maps of Twitter. Those maps showed which parts of the world produced more content than others. However, what they failed to do is account for differences in Internet penetration around the world. The above map normalises the Twitter data by internet population data: revealing the parts of the world that are home to internet users who are more likely to publish content on the platform. You can see that the differences between places are not slight ones. Internet users in some countries (like Malaysia) are dozens of times more likely to tweet than internet users in places like India or Kenya. As in painfully obvious in 2017, information in social media streams can have an outsized influence. Knowledge shared on Twitter can shape how people around understand society, the economy, and politics. But, as we see here, that knowledge has distinct geographies. It is far more likely to be created in some places than others. Graham, M. 2015. Information Geographies and Geographies of Information New Geographies 7 159-166. Graham, M., S. Hale & M. Stephens. 2011. Geographies of the World's Knowledge. Convoco! Edition. Straumann, R. K., Graham, M. 2016. Who isn’t online? Mapping the ‘Archipelago of Disconnection.’ Regional Studies, Regional Science. 3(1) 96-98. It is open access, so please head over to the journal to take a look at the full piece. For many people, internet access is an essential part of everyday economic, social, and political activities (c.f. Graham and Dutton 2014). Yet access to the internet is, and has always been, geographically concentrated (Graham, Hale, and Stephens 2012, 2011). As such, it is important to focus on the people and places that are largely left out of digital connectivity. This visualisation looks at these in terms of internet penetration (i.e. the share of their population that have “used the Internet (from any location) in the last 12 months” (source: UN 2015)). The map highlights all territories that either have internet penetration below 10%, or for which no data from the World Bank exists. A lack of data can exist for several reasons, for example: some of these territories are statistically grouped together with bigger entities, no data have been collected or inferred, or the territories lack widespread recognised statehood. 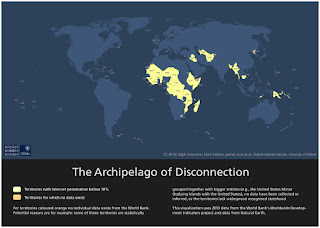 The map ultimately highlights an archipelago of land whose population is mostly cut off from the internet. This Archipelago of Disconnection has its centre of gravity in Sub-Saharan Africa where 28 countries have internet penetration rates beneath the 10% threshold we applied. As the internet becomes ever more embedded into global economic flows (Malecki and Morisset 2011), to the inhabitation of urban spaces (Graham 2013), and to other facets of everyday life, those living in the Archipelago of Disconnection are largely barred from participating in the cultural, educational, political, and economic activities that it affords.